The annual Formation Zone Business Challenge provides the opportunity for students and recent graduates to compete for funding to develop their own business. Formation Zone is looking for budding student entrepreneurs to submit their innovative business ideas – with a chance to see them become reality. The annual Formation Zone Business Challenge, which was officially launched today to coincide with National Enterprise Week, provides the opportunity for students and recent graduates to compete for funding to develop their own business. There are six categories – Digital and Technology, Creative, Environment, Marine, Health and, for the first time, Social Enterprise, supported by Plymouth Social Enterprise Network. The competition, which has a total prize fund of more than £10,000, sees students suggest their initial idea and take part in workshops and online discussions to prepare it for submission. During this time, they receive business advice from experts on everything a submission will need, from marketing strategy to budget forecast. When the winners of each category are chosen, they will receive a share of the winnings to start up their business, along with six months of expert one-to-one advice from business professionals. Formerly known as the Tectona Business Challenge, the initiative has seen several students go on to run successful businesses, with many still at the helm and others selling them to move on to new ventures. 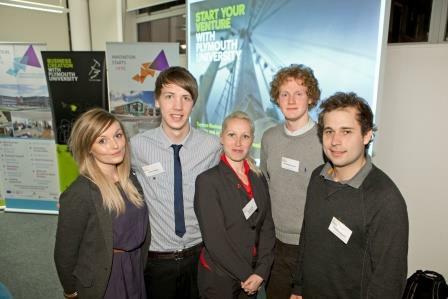 The Formation Zone Business Challenge is open to all current students at Plymouth University, graduates from the past two years and students from partner colleges. We are delighted to be launching the Formation Zone business challenge as it presents a huge opportunity for anyone with a business idea. That is really all anyone needs to enter – an idea. From there our experts can help you to develop it and put all of the practical pieces in place. It is not just about winning a competition, we will help all students taking part develop the skills they need to start Plymouth’s enterprises of tomorrow. The Formation Zone Business Challenge benefits from the generous support of Santander Universities, who also provide a range of scholarship opportunities for University students and staff. It allows the challenge to offer generous awards, with students competing to win cash prizes of up to £1,500 and business start-up support worth over £1,000. It’s fantastic to be able to provide students with the opportunity to start up their new business as funding can often be a limiting factor. In such a thriving environment I’m sure there will be some wonderful business ideas and we look forward to helping to turn them into reality.